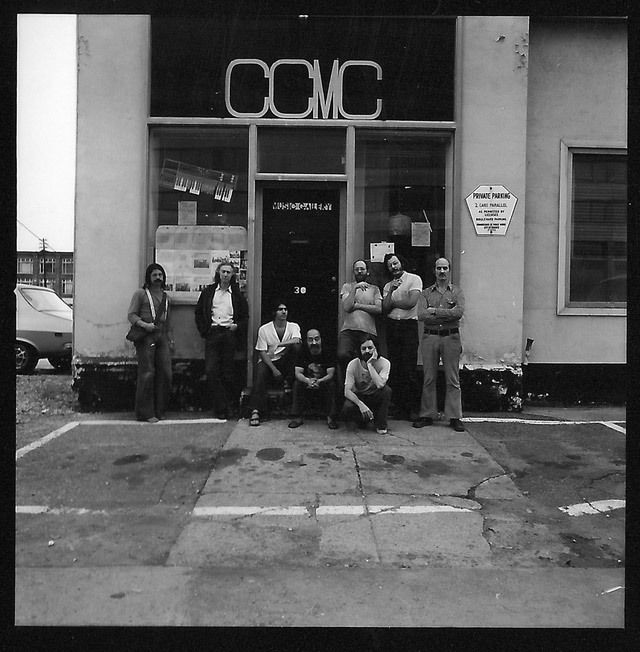 Photo of the founding members of Toronto’s Centre for Creative Music at 30 St. Patrick Street, circa 1976. Check out Michael Snow, second from left. Courtesy of The Music Gallery. MUSIC: The nexus for experimental music is celebrating an important milestone tonight: The Music Gallery‘s thirty-three and a third birthday (thirty-three and a third being a meaningful figure as this is the RPM of a long-running record). The Music Gallery’s fundraiser brings together young, enterprising Toronto musicians like Apostle of Hustle, as well as performances from past and present members of the creative hub. Several hundred experimental vinyl records are also on sale. The Music Gallery (197 John Street), 8 p.m. $33.33, $20 for students, seniors, members, and art workers. ART: The wonderful Shary Boyle, known for her dark, twisting, Victorian-styled sculptures, opens a new exhibit tonight with Cape Dorset artist Shuvinai Ashoona at the Justina M. Barnicke Gallery. Both talented women use the little-known arctic phenomenon of the Noise Ghost as a starting point for the show. The Ghost, said to occur on cold winter nights when a slight but high-pitched hiss encircles a dwelling, works as a nice entry point for both artists who traverse fantastical, eerie places in their work. Justina M. Barnicke Gallery (7 Hart House Circle), 5 p.m., FREE. POETRY: The Rust Belt Poetry Slam, a long-running American poetry competition, is hosting its first event outside the States and has chosen dear old Hogtown to hold its four-day fest. The festivities kick off tonight at the cosy Queen East dive The Dominion, where last-chance hopefuls compete for two spots on the strong Toronto team. Other teams participating in the slam include Cleveland, Detroit, and Columbus. Check out the rest of the events here, which round up on Sunday eve. The Dominion (500 Queen Street East), 7 p.m., $5. ART: Remember that scene in This is Spinal Tap where Nigel shows off his amp that notches up to eleven? The Power Plant Contemporary Art Gallery references that sonic edge from Rob Reiner’s classic mockumentary for its eleventh annual Power Ball fundraiser; this year’s installment is entitled It’s One Louder. While the power of an extra setting on an amp is questionable, this party is a sure thing (if you can afford it, of course). Check out performances from $100 and Parallels, along with work from New York artists Agathe Snow and Lawrence Weiner. The Power Plant Contemporary Art Gallery (231 Queens Quay West), 8:30 p.m., $160, $150 for members.